A seriously limited-edition Red Dwarf cover is out there... somewhere. 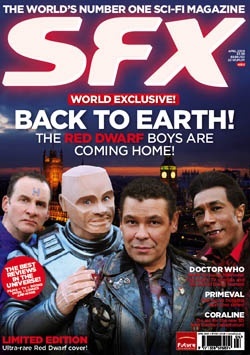 Red Dwarf appears on the cover of this month's SFX magazine... if you're cunning enough to locate a copy. 50 copies of the April issue have been printed featuring Back to Earth and then hidden among regular copies of the mag on newsstands up and down the country. These 'Golden Cover' editions, timed to tie-in with the broadcast of the brand new episodes on Dave, are special for a second reason, though: a copy appears within the episode itself! Readers who aren't fortunate enough to track down a special cover on the newsstand are also in with the chance of winning a version through both www.sfx.co.uk	and www.joindave.co.uk. 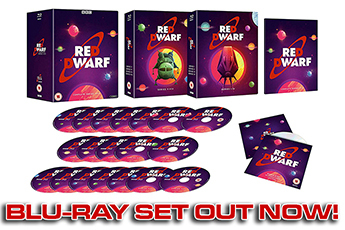 Dave Bradley, Editor of SFX, said, "The SFX team are massive fans of Red Dwarf and will be glued to Dave this Easter. As Europe's biggest sci-fi magazine we are delighted to be teaming up with UKTV for this innovative and incredibly post-modern concept. 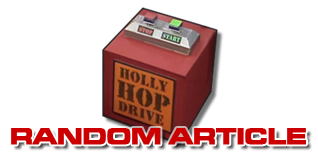 "Our cover plays a key part in the storyline, and we've decided to celebrate by giving our readers and Red Dwarf fans a chance to find their own collector's cover. This is real Charlie and the Chocolate Factory stuff - keep your eyes open, as nobody knows where these covers will turn up!" The April issue of SFX magazine goes on sale Wednesday March 11, with a coverprice of £3.99. 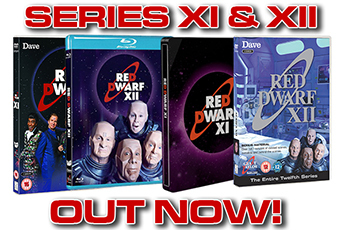 Just fifty copies with the special Red Dwarf covers will be available across the UK. Red Dwarf: Back to Earth premieres on Dave on April 10th.